Stacy Says It: Hands Free Mama Giveaway! If you haven’t checked out her HandsFreeMama site, I would highly recommend you doing so immediately. It completely changed my outlook on life, and my behavior soon followed suit. Stafford’s first book was recently published and it instantly hit the New York Time’s Best Seller List. Hands Free Mama details the pitfalls of multi-tasking all the time, adding to the already warped pace of our world. It provides an easy guide to just setting down the technology and going “hands free,” even if just for small bits at a time until you are able to fully confront your addition. The result is re-establishing honest-to-goodness live interactions with people and rediscovering those things that are near and dear to your heart by being fully present. 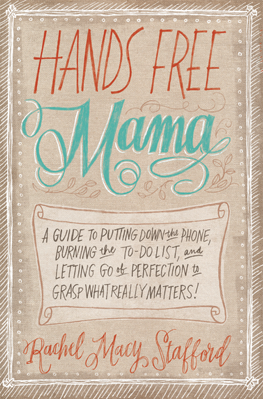 One lucky reader will receive a FREE copy of Hands Free Mama, compliments of Zondervan. Required disclosure: Zondervan provided the book, valued at $15.95. All opinions are my own. I will provide the randomly selected winner the paperback Hands Free Mama book. Simply click below to enter.